DYNATUNE SUSPENSION DESIGN MODULE was created in 1989 in FORTRAN and a few years later rewritten in Turbo Pascal. Up to 2007 the software/calculation algorithm could not be imported into MS EXCEL due to the lack of standard MATRIX functions, which only became available in MS EXCEL/OFFICE 2007. Now today the workbook exists in its most complex variant out of 26 worksheets, when filled with results it contains a total of more than 17 million cells created with more than 22000 formula calculation cells. 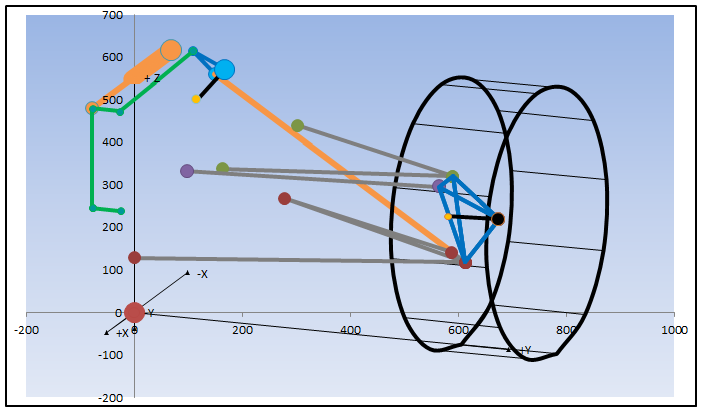 Primary Input Data for Calculation are the Coordinates of the Wheel, the 10 attachment points of the 5 Links and the 2 Coordinates of the Spring/Damper Unit. These coordinates can be entered either in the proprietary DSDM Coordinate System or a typical OEM Coordinate System with consequent coordinate transformation into DSDM sign conventions. Additionally some specific setup & car data like STATIC TOE, CAMBER and STATIC LOADED RADIUS must be entered together with the maximum spring displacements in Jounce/Rebound Travel or in the case of a "steerable" suspension maximum Steering Rack Travel can be entered. 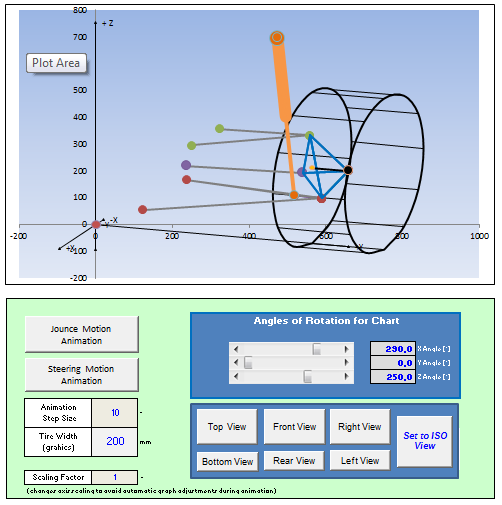 DYNATUNE SUSPENSION DESIGN MODULE comes with a Corner Suspension View/Animation Window that permits to check model layout during the data input phase and allows to see the animation of a Jounce and Steering Motion (or if calculated, the combined motion of them as they would occur on the car). 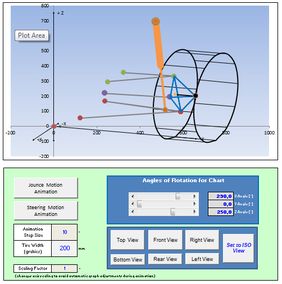 For maximum user convenience the View/Animation Window can be set to 7 Pre-Set Views or can be rotated around every reference axis by entering a custom rotation angle. The View/Animation Window can be scaled to zoom and the animation "frame" rate can be set manually. As mentioned before the post processing in DYNATUNE SUSPENSION DESIGN MODULE is entirely based on applied vector algebra. This implies that all results are derived only from the 3 dimensional movement of the Upright/Knuckle. The actual position of the links is irrelevant. This fact allows correct calculation of all suspension parameters even for complex suspensions with a virtual steering axis. For quick reference and model verification one can check the most important suspension and steering system parameters in a small table. All calculation Results are being stored in a freely customizable RESULTS Sheet. The RESULTS Sheet contains more than 50 different data columns of Suspension Parameters and contains also all the Graphs that are available on the User Interface for further custom Post-Processing on the sheet. For convenience up to 4 Calculation Results Data Sets can be stored together with the input data into 4 Reference Sheets for Comparison and eventual future Re-Loading/Re-Calculation. Last but not least one can export the Suspension Model Data Set into an external MS EXCEL File which allows effective Data Management and provides a convenient way to transfer the input data from one license to another license of DYNATUNE DESIGN SUSPENSION MODULE. In the "RACE" Version of DSDM a Push-/Pull-Rod Rocker System has been superimposed on the BASE Suspension Architectures. These Rocker Systems can be selected to be with or without a Anti-Roll Bar Linkage. The Anti-Roll Bar Linkage itself can be configured to be either a U-Bar or T-Bar configuration. Primary input data for Push-/ Pull-Rod, Rocker and Anti-Roll Bar Linkage are the coordinates of the various attachment points. These coordinates can either be entered in the proprietary DSDM Coordinate System or in a typical OEM Coordinate System with consequent coordinate transformation into DSDM sign conventions. Based on the selected Rocker Configuration Template the input table will be dynamically adjusted. 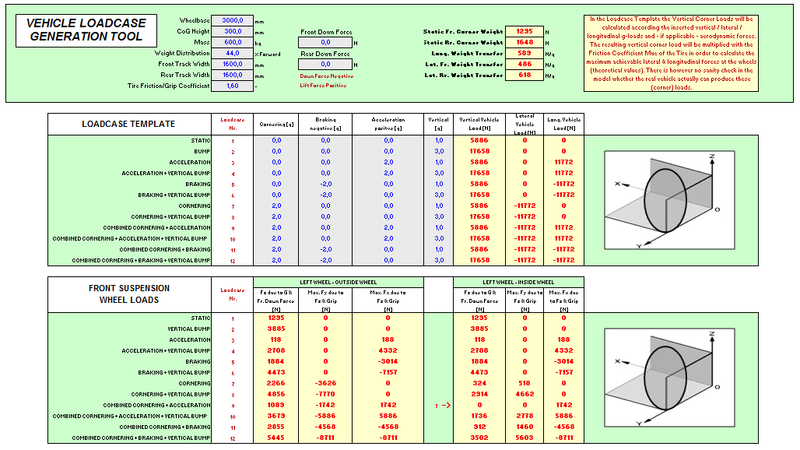 In addition to the "Base" Version, the "Race" Version provides in the tabular RESULTS output sheet all important data & characteristics of the Push-/Pull-Rod, Rocker and Anti-Roll Bar Linkage (about 25 parameters). Next to classical translational motion ratio's for coil spring systems also angular motion ratio's and deflection angles are calculated in order to lay-out systems based on torsion springs in the Rocker axis. The executive summary of those data are presented on the Master Dashboard Sheet for quick verification. 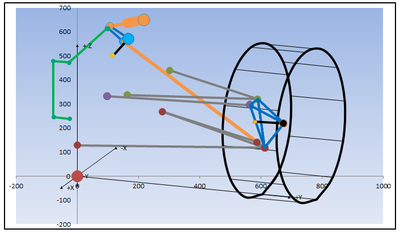 For detailed analysis of the Rocker System a range of 12 additional Pre-Set Graphs is available. The Graphs can also be conveniently enlarged to a custom set value and allow confronting up to 5 variants at once. The Graphs are arranged according their typical use to in Jounce/Roll Motion. The Key Feature of DYNATUNE "PRO" SUSPENSION DESIGN MODULE is the unique possibility of adding Link Stiffness to the Geometry which allows to investigate the effects of Compliant Suspension Characteristics. By entering appropriate values in the corresponding input cells or by setting the numbers to 0 one can activate or deactivate the link compliance. This allows a detailed analysis of the influence of each link on the overall suspension performance and provides an excellent up-front design tool prior to having to revert to complex and costly multi-body-system analysis tools. The RESULTS for all Compliance Effects are shown in the Table below. By entering a value for Pneumatic Trail the effect of Tire Aligning Torque will be considered and when using a McPherson Strut Suspension optionally the Bending of a Damper Strut can be included. When entering numbers Link Stiffness Values this table will be automatically calculated and present for all load applications that can apply the wheel typical geometry compliance gradients. In effect the the table summarizes for the most commonly used suspension parameters how much this parameter changes per kN of applied load. The Link Stiffness Value is a "Lumped Number" consisting out of various local stiffness contributors that have to be united into one single value. Below shown is the picture of the tool which is being used to add/break down the most important stiffness contributors in the overall link assembly system. By entering measured numbers or by relying on historical reference numbers a good estimate for the Total Link Stiffness can be calculated. Since all local stiffness contributors are added as "Springs in Series" the weakest component defines the final overall stiffness number dominantly. The Key Feature of DYNATUNE "EXPERT" SUSPENSION DESIGN MODULE is the like the "PRO" Version the unique possibility of adding Link Stiffness to the Suspension Geometry which allows to investigate the effects of Compliant Suspension Characteristics. On top of the Features in the "PRO" Version the "EXPERT" Version comes with some additional extra Features. 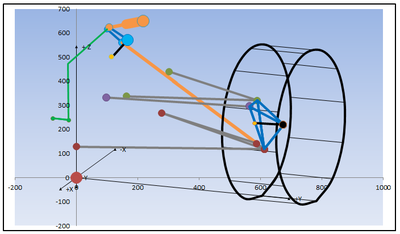 With this feature an experienced Suspension Designer can quickly cross check not only the geometric performance, but also the compliant performance and the various link load paths. 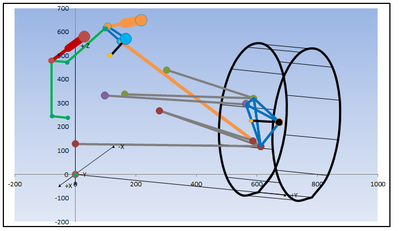 Last but not least the "EXPERT" Version offers a VEHICLE LOADCASE GENERATION TOOL which allows to create a reference table for approximate Suspension Corner Loads based on imposed vehicle accelerations in X, Y, Z direction and aerodynamic loading. The 12 most commonly used loadcases in automotive engineering are represented in a freely customizable G-Table. With an elementary vehicle model the resulting vertical corner loads are calculated for each wheel. By multiplying the vertical load with a theoretical Tire Friction Value µ the maximum possible X- & Y-loads are being defined. 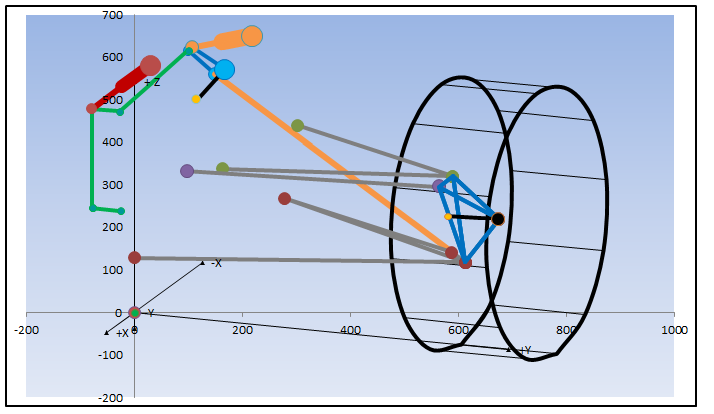 Out of these 12 scenarios one can select the most interesting one and manually enter the numbers in the Suspension Loadcase Analysis Tool.